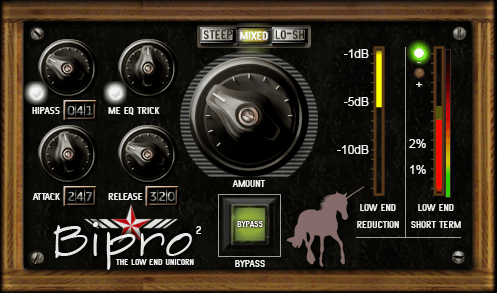 Bipro – The Low end fix unicorn magic thing…. Bipro is a plugin with different tools to control the very low end, that is below 50Hz. It’s very common that mixes made with small speakers (6″ and even 8″ inch speakers) have problems in the low end simply because they’re not able to reproduce what’s going on down there. When you try to push a mix like that to compete with commercial levels it will start to sound bad and misbehave in all kind of ways. You can hear and see one example what can happen and how to use Bipro to fix that in the demonstration video below. We had an idea that maybe it would be good if there was a preview button in our low-end measuring plugin Evouyn that would cut off any excessive bass so that you could get an idea of how big the damage down there really were. We came so far that a beta version was made and our beta testers started to do their job. We usually deliberately refrain from telling how we meant to use the new feature since beta testers’ first reaction is invaluable when evaluating the usability of a new function. In this case, we were horrified at how our beta testers started to use the preview feature to actually process their masters, that was not our intention!!!! The filter we used sounded terrible (we thought) and was only there to give a rough idea of how much bass that needed to be controlled or cut away. We ditched the feature when we realized how high the risk of people using it improperly was. We went on with the next project when one of our beta testers e-mailed and asked for an adjustment… We told him that he was using it wrong and that the feature wouldn’t pass the beta stage. Then another beta tester e-mailed and asked for an adjustment since he started to use it on all his masters… Then a third… Then yet another… Within 9 days all beta testers except one had requested different functions and updates. Ok, we get it, people liked the simplicity of an one button quick fix but we won’t put it in Evoyun. We made Bipro, a by-product from a function in another plugin that never got implemented. The first version got an unicorn and lots of glitter on the GUI to mock our beta testers (they can take it, it’ll just put a smile on their faces). Then Johannes, our main developer, started to use it in his daily work as a mastering engineer (!) since the result he got with Bipro was better than with more conventional tools even though it lacked some main features… That’s fixed in Version 2, we don’t mock our Beta testers anymore, this is a great tool once you learn how to use it.